Two years post miracle, sixteen-year-old Hazel is post-everything else, too; post-high school, post-friends and post-normalcy. And even though she could live for a long time (whatever that means), Hazel lives tethered to an oxygen tank, the tumours tenuously kept at bay with a constant chemical assault. Enter Augustus Waters. A match made at cancer kid support group, Augustus is gorgeous, in remission, and shockingly to her, interested in Hazel. Being with Augustus is both an unexpected destination and a long needed journey, pushing Hazel to re-examine how sickness and health, life and death, will define her and the legacy that everyone leaves behind. I saw somewhere that the 4th of February was World Cancer Day, and thought I'd re-read The Fault in Our Stars so I could review it today. If you don't want to read a long review, here's my summary: Read. This. Book. It is perfect. There's nothing glamorous - life goes up and down, it's sad and it's funny, it's not fair. It's real. In The Fault in Our Stars, John Green introduces us to two extremely philosophical teenagers that have been through a lot more than most people, with the knowledge that there is only more hardship to come. He humanises something I know I have never really thought about - the feelings, and more specifically, the sense of humour cancer sufferers/survivors have throughout it all. I talk about the humour later, but something that really got the message across was Hazel finally admitting her biggest fear to her parents. Hazel, the girl who decided to become a vegetarian so as to "minimise the number of deaths I'm responsible for." "'I'm like. Like. I'm a grenade, Mom. I'm a grenade and at some point I'm going to blow up and I would like to minimise the casualties, okay?'" It was the realness of the characters that got me so attached. For the last third of the story, I was unabashedly sobbing (luckily, alone. The first time I finished this, I was on a bus). To be blunt (and a little bit gross), the best way I can describe the end of this book is like this. When I was a child, I'd be crying my eyes out over something or other, and my mum would be comforting me. When the worst was over, she'd joke that I'd better not have got snot on her jumper, which would make me laugh through the tears. I'm trying not to put spoilers in here, but the next quote, for example, happens just after one of the most poignant parts of the book. It lightens the mood without altering the seriousness, and at the same time reminding us that they are, after all, only teenagers. "He smiled. Gallows humour. 'I'm on a roller coaster that only goes up,' he said. 'And it is my privilege and my responsibility to ride all the way up with you,' I said. 'There is no try,' I said. 'There is only do.'" 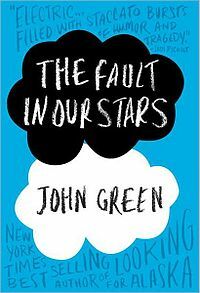 John Green managed to blend humour and tragedy perfectly. If you've read the book already, he wrote a blog post answering questions about the book - I'd recommend a read. I don't want to waffle, so I'll leave it there, but I'd wholeheartedly recommend The Fault in Our Stars - it's an instant favourite and already has a place in my heart. Don't forget the tissues! Oh, and about the film that's apparently in the works - did anyone else picture Hazel as looking a little like Ellen Page in Juno? Maybe it's a similar attitude to life, but I could only see her as this! PS - Sorry for anglicising the quotes - habit! A very tall, lanky 11th grader at our international school in Tokyo, had this book checked out many days past its due date. Since it is one of the books nominated for the Japanese International Schools' "Sakura Medal" award, we insisted that he return the book so that other students could read it. This young man, who was not a particularly avid reader, brought the book back and explained sheepishly that he had read it five times through and even admitted that it had made him cry. Wow. Must be a powerful book. It is on my "to-read" list. It's extremely powerful, because you can identify with all the characters - even the minor ones. Hazel and Augustus use a lot of philosophical theories and words but somehow that makes them more human. I would have loved this book as a teenager, too!